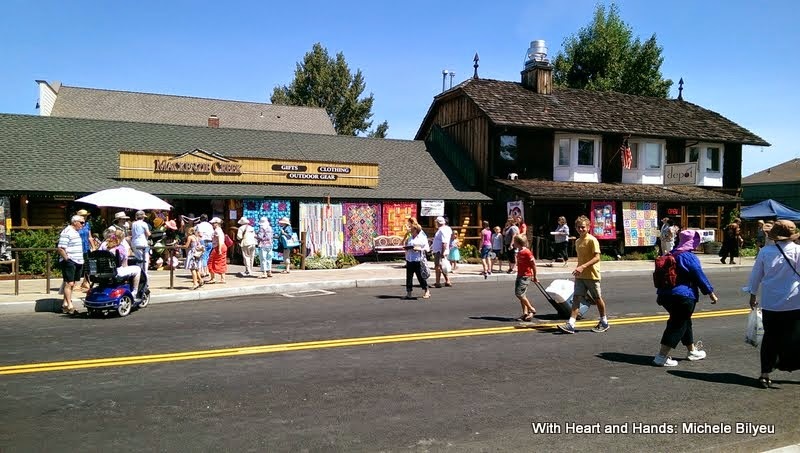 When quilters say they want to go to Sisters some day, and see the amazing little Western town that is transformed one day a year into a quilted wonderland, I tell them: "It's something a quilter needs to do at least once in their life!" I'm fortunate to live just a couple of hours or so away, in Salem, Oregon. And I try my best to go each and every year that I'm in Oregon and not helping family in Alaska. 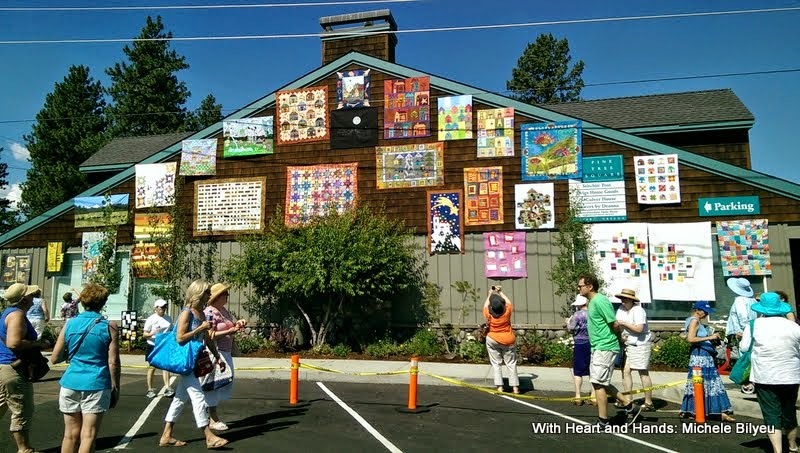 And some years, I've returned to Oregon just to be sure not to miss this amazing quilt show. Sisters, Oregon is a very small 1880's styled 'Western' town in Central Oregon. It boasts a population of get this...about 1,460. 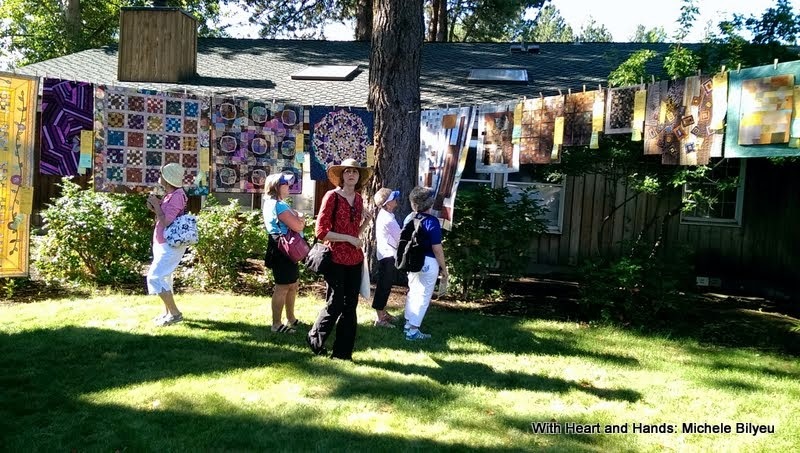 And for one day in July...always the second Saturday of this month, up to 15,000 quilters swarm in and take over the town. Somewhere around 1,000 to 1,300 quilts are displayed,....on every single available surface that the eyes can see, and the hands can reach! 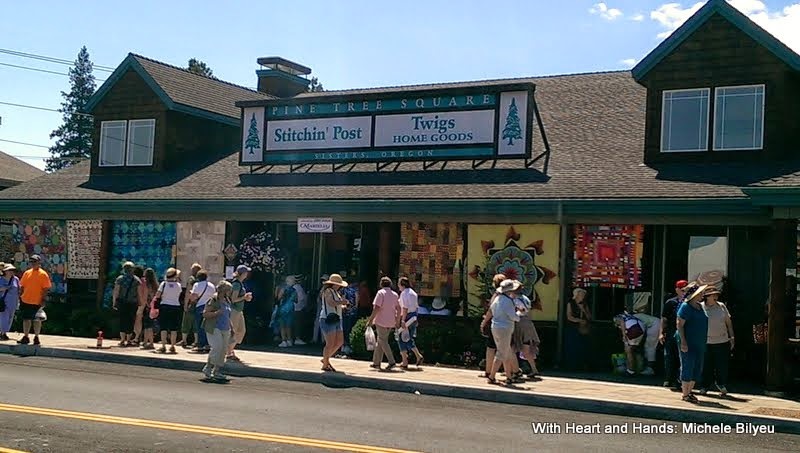 ...and of course the famous Jean Well's "Stitchin' Post',which is a pretty unbelievable quilt and fabric shop along with "Twigs" which sells unique giftware and home decor items. 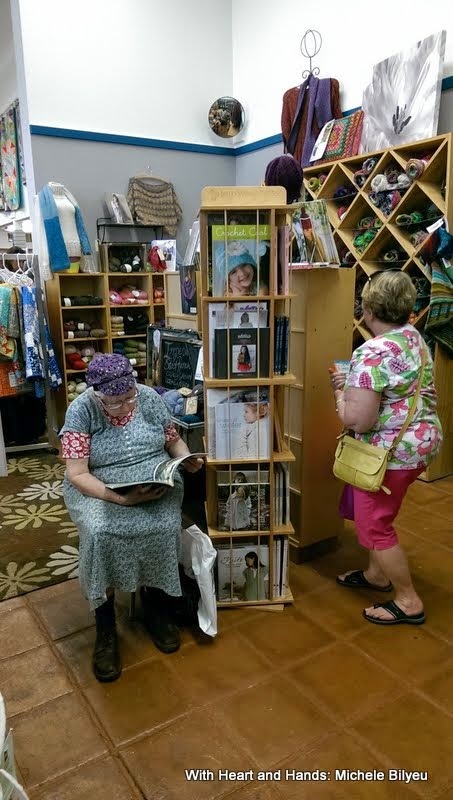 where a woman was buying a quilt that was for sale, the darling salesgirl turned and caught me taking the photo! And lovely shoppers/readers/ purchasers who caught my eye and I couldn't resist taking a photo! Cute, cute, cute! 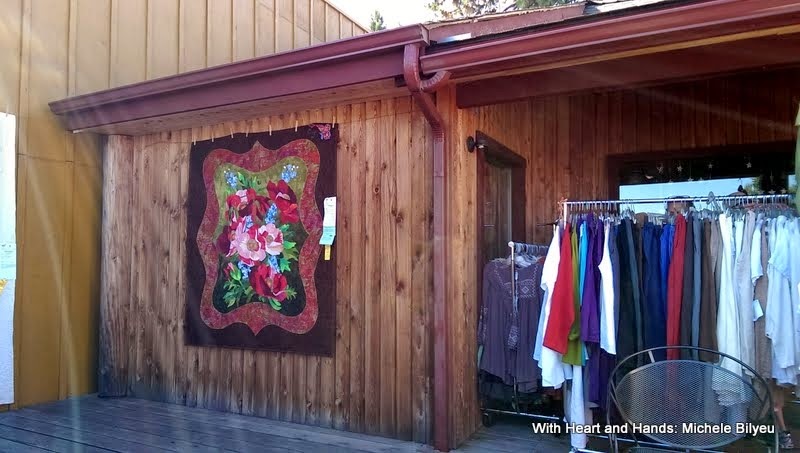 Quilts both inside and out, range from traditional to folk, to liberated and improvisational, to modern, and everything in between! 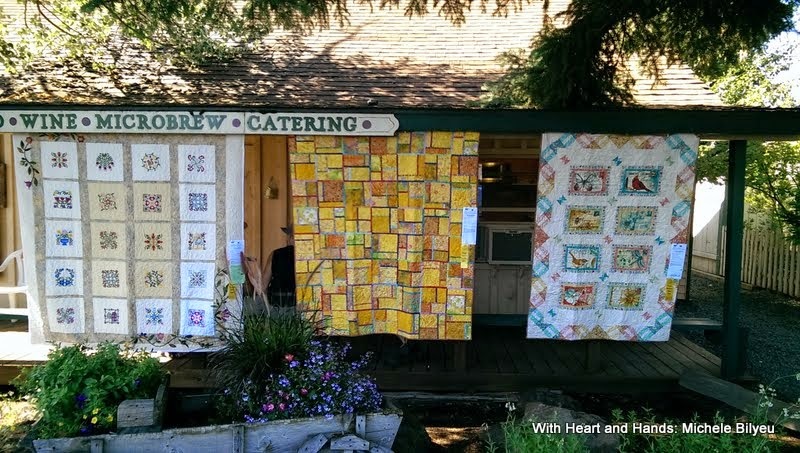 They are made by both men and women, alike and this year there was a ManLand just for those quilts as well as one for childrens quilts. I'll show more photos in other posts, too much eye candy for one blog post, trust me! 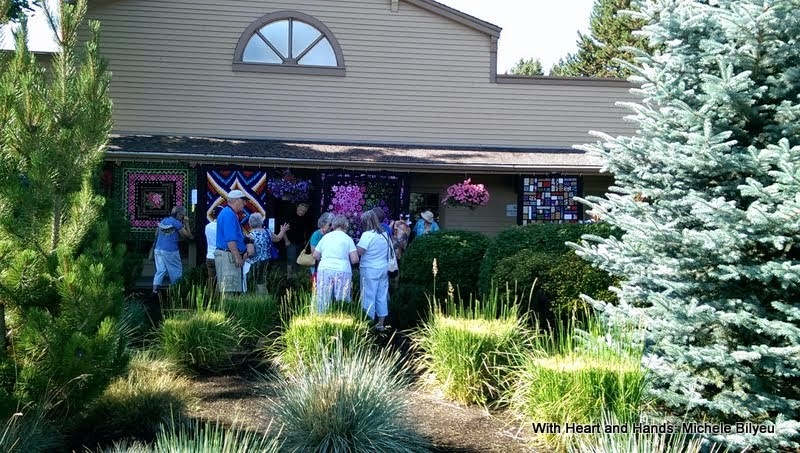 Everyone should go to this show...at least once.....and if you go back again, you know you're a dedicated quilter, or quilt lover; because the heat, the crowds and the traffic, make for a challenging experience in some ways. But for the rest of us...it's the most quilting fun we can have in a year! I once overheard a lady from Canada describe it as being..." a once in a lifetime experience" and she also added that she "absolutely loved it!" 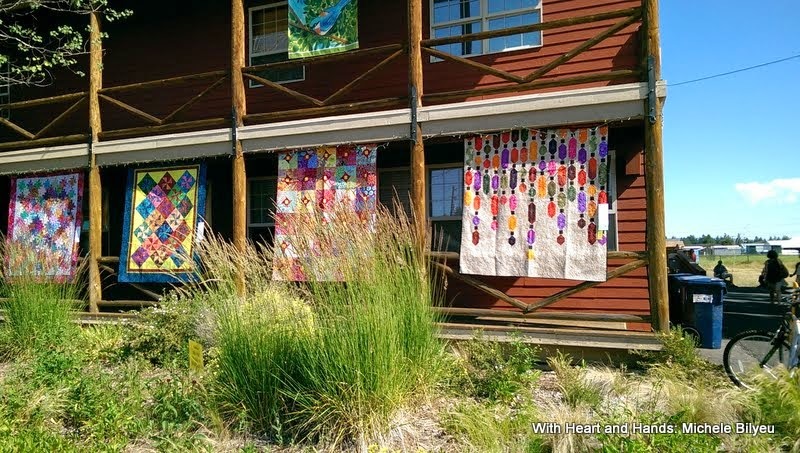 Two Rivers Three Sisters is an amazing 40' quilt installation that has been called "A Masterpiece of Contemporary American Fiber Art." Originally called the "Quilt for Two Rivers" after the National Forest Foundation’s Tale of Two Rivers conservation campaign. 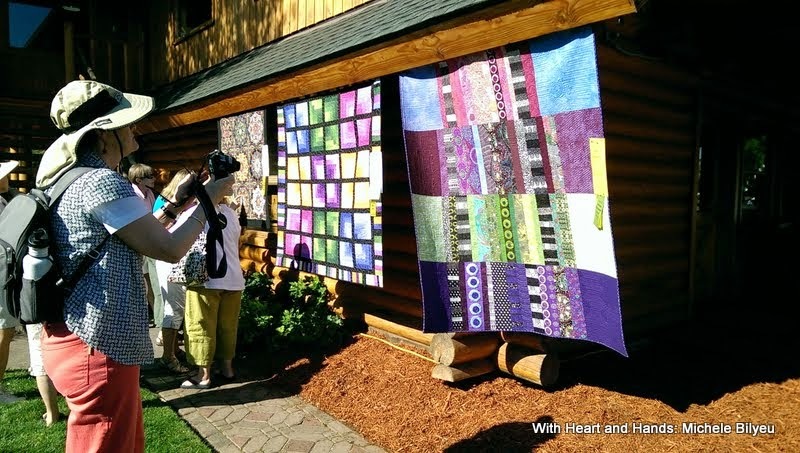 The Two Rivers Three Sisters Quilt is a unique collaboration between the Sisters Outdoor Quilt Show, the National True to its art form, the quilt tells a story. 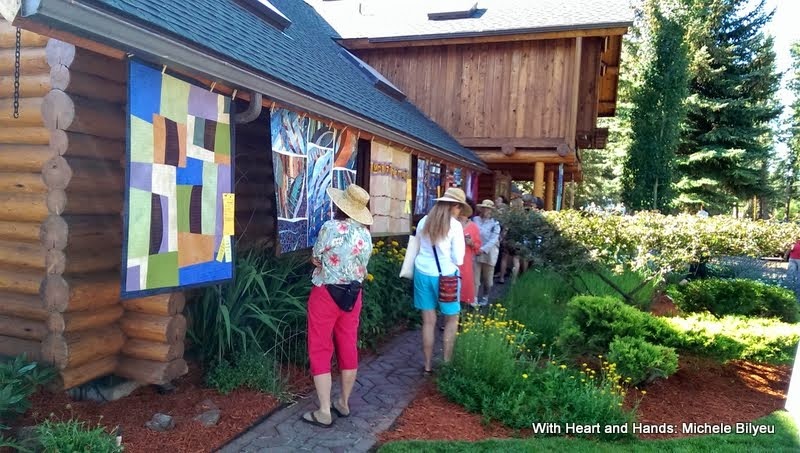 And each of its parts contributes to the whole as 19 artists share the love of two rivers... Whychus Creek and the magical Metolius River of Central Oregon in the Three Sisters wilderness area which surrounds the town of Sisters. 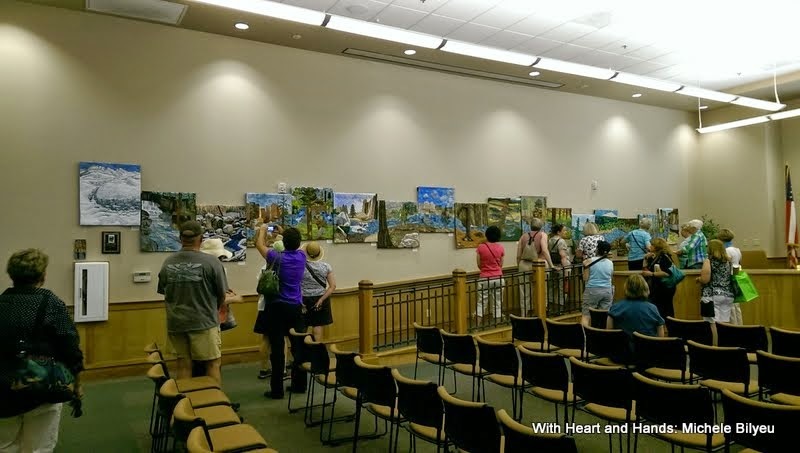 It now hangs in the Sisters City Hall, shown above, it is a true collaboration of art and beauty! And I will be featuring additional quilts, descriptions and impression in posts to come! My toes are curled under....I so badly wished I had been there....amazing pix and it looks like just the sort of party I like :) Thanks for sharing and keeping me in the know about what is going on out there! Hi!!! Thank You Michelle!!!! Wow!!!! That would be a wonderful place to visit!!!!! 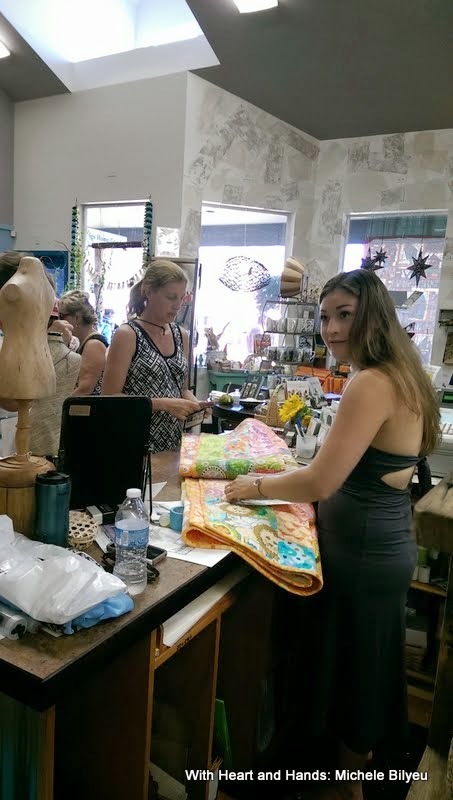 Quilts everywhere!!!!! A quilters dream!!!! Some day I will get to go...but for now, thank you for the lovely pictures!! Michelle I wish I had know you were going we could have met there. 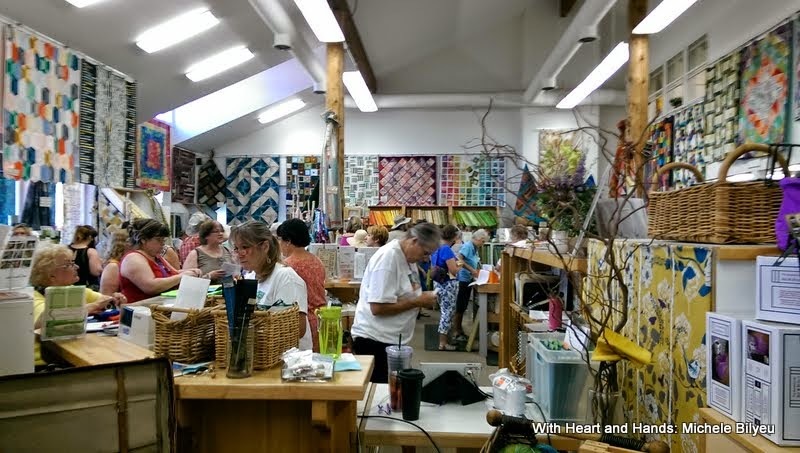 I stayed with my friend for a week and she works in the quilt show office. I volunteered in the office a bit and also helped her hand the QBC (quilt block contest blocks) for the show as well as the quilts made from last years contest, including 2 quilts that came from the Japanese winners. I had 4 quilts in the show, including my quilt that I made from last years QBC and I entered this years QBC but didn't win. 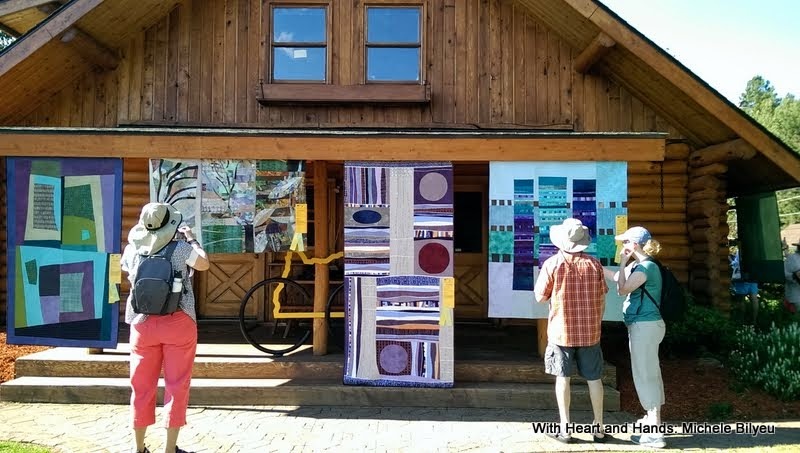 There ws a total of 1401 quilts in the show this year, which is about the max they can accept for hanging. I took over 1700 photos, although not all from the show.I'll be posting on Flickr a little at a time. oops I meant I helped to hang not hand the quilts! Thanks for letting us go on the trip with you - and without having to feel the heat to boot! 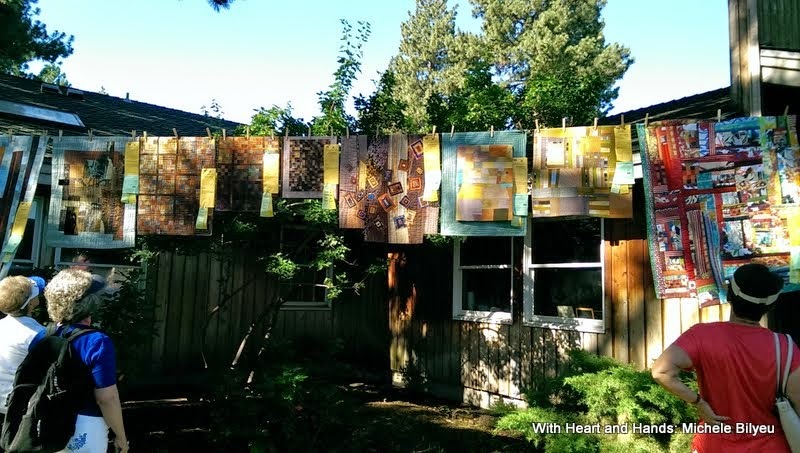 I love how you showed all these beautiful quilts on buildings so we could get a feel for the setting. What fun! It's one show I've always wanted to see!